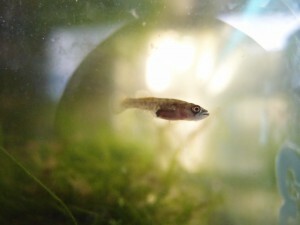 A small A. prognathus (Salamanca), some ten days old. I have been worrying about controlling nitrate and levels of other waste products in my tanks, to maximize juvenile growth of small ambitious fish like this. In some places the tap water is really excellent, in others it’s barely acceptable which makes the level of difficulty to maintain some species very variable. I also start believing that local tap water properties really determine how many people engage in the aquarium hobby and also determine the fish species that do well and are maintained in the killifish community. Wouldn’t it be nice if we could make some things “easy” anywhere? In many situations, replacing water when it’s almost too late can help of course, but I prefer to be ahead of things, to avoid excessive levels to build up or to “clean” the tap water. So I am moving away from tanks with just some peat on the bottom, and I add zeolite now, just a little, to see how it behaves, what the effects are and if it might help to make raising fish easier everywhere. Plans are to measure lots of tanks and different waste product treatments later, in a situation where I start from dechlorinated tap water. Will be some work: all samples will have to be filtered and frozen before they can all be analysed together. This entry was posted in Austrolebias, Ideas, Maintenance by tvdooren. Bookmark the permalink. Sounds like an interesting experiment. You will now have two ion exchangers in the the tanks, I wonder if it could end up with some weird ion composition in the water.dependent on affinities and concentrations. But of course, that may be very complicated and of possibly minor importance to killies especially. Given the low densisties of fish, saturation of the zeolite with subsequent problems should not be the case, but sudden burden with products could be a problem. in the last sentence… sudden burden with waste products, I mean. Interesting experiment. Expecting results… ?at my actual home I have problems with tap water quality…it makes difficult breeding killifish sometimes… ? can you sell eggs of ex-megalebias? I don’t really sell, only exchange sometimes.